Carl Pei wants you to believe in OnePlus. It’s been three years since this 26-year-old co-founded the company, and as he’s talking to me, the OnePlus 3, the company’s latest flagship, is due to arrive in less than a week. Things are different this go-around: the infamous OnePlus hype machine has been operating far more quietly than in prior years and the much-hated invite system to buy phones has been scuttled. “We’re using a different approach for our third year,” says Pei. “As a company grows, expectations change and we have to be more responsible of a company. We just couldn’t sell on an invite system at this point in the company’s history.” The new phone is available direct from OnePlus starting today, without requiring you to jump through any hoops to buy it. No matter how it’s sold, the OnePlus 3 might be the first affordable phone that truly makes good on the promise to be as great as the high-priced flagships from the likes of Samsung and HTC. It has everything we’ve come to expect from high-end Android phones — fast processor, premium design, capable camera, quick charging, a great display — but sells for just $399 unlocked. That’s about $300 less than you’ll pay for a Samsung Galaxy S7 or HTC 10, which have similar specs and features. Pei wants you to believe that OnePlus has learned a thing or two over the past few years, that it’s a more mature company and not just a scrappy upstart. Mostly, he wants you to believe that a young company like OnePlus can produce a device that’s as good as, if not better than, the established stalwarts in the smartphone industry. After spending the past week with the OnePlus 3 in my pocket, I’m beginning to feel like a believer. The first lesson OnePlus learned for this year’s phone is evident when you pick up the OnePlus 3. It’s an incredibly well-built device, with a unibody aluminum finish, tight tolerances, and good proportions. Unlike last year’s brick-like OnePlus 2 or OnePlus X that were rough around the edges, the 3 is comfortable to hold, thin without being too thin, and agile when going in and out of my pocket. These are the kinds of things that much older companies like Samsung and HTC took years to get right and are still figuring out, yet OnePlus has managed to pin down in just three generations. The OnePlus 3’s design is far from original — it looks like the love child of an HTC and a Huawei with the front of an iPhone 6S — but it’s attractive and functional. It doesn’t turn heads like Samsung’s Galaxy S7 Edge, but it’s not so generic as to look like an unfinished reference design. 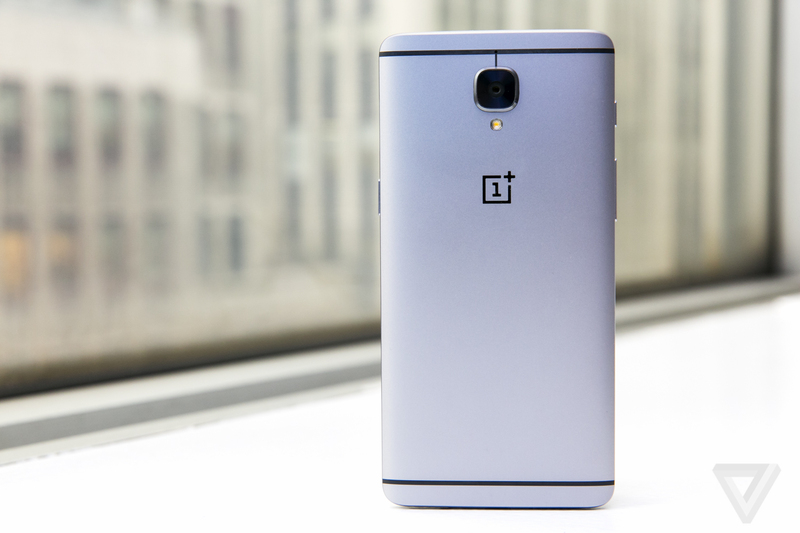 The smooth, matte metal back isn’t as unique as the sandpaper-like finish on the OnePlus 2, but the company is selling a case with that finish for the new phone. THE ONEPLUS 3’S DESIGN ISN’T WHOLLY ORIGINAL, BUT IT’S REFINED AND FUNCTIONAL The fingerprint scanner below the display is fast and reliable — a significant improvement over the OnePlus 2’s — and the 3 still has the super useful switch on the side for toggling between Android’s three notification settings. It’s by far my favorite hardware feature on the phone and something I wish all Android phones came equipped with. If you’re reading the OnePlus 3’s spec sheet, you might notice that its 5.5-inch 1080p display isn’t as high-resolution as the screens on the Galaxy S7, HTC 10, and other phones released this year. But if you didn’t look at the spec sheet and just used the phone, you’d be hard-pressed to notice the difference. Pei says it was a “conscious choice” to use a 1080p screen in place of a higher-resolution option, as it provides better performance and heat management than more pixel-dense screens. I’m inclined to agree: the AMOLED screen on the OnePlus 3 is bright, vibrant, easy to see outdoors, and at 401ppi, plenty sharp enough for human eyes. You might want something more pixel-dense for virtual reality, but for everything else you use a smartphone for, the OnePlus 3’s screen is more than sufficient.